Source: ‘I.M. Pacatus’ (Maxim Gorky), Nizhegorodski listok, 4 July 1896, translated (by Leda Swan) and reproduced in Jay Leyda, Kino: A History of the Russian and Soviet Film (London: George Allen & Unwin, 1960), pp. 407-409. Text: Last night I was in the Kingdom of Shadows. If you only knew how strange it is to be there. It is a world without sound, without colour. Every thing there — the earth, the trees, the people, the water and the air — is dipped in monotonous grey. Grey rays of the sun across the grey sky, grey eyes in grey faces, and the leaves of the trees are ashen grey. It is not life but its shadow. It is not motion but its soundless spectre. Here I shall try to explain myself, lest I be suspected of madness or indulgence in symbolism. I was at Aumont’s and saw Lumière’s cinematograph—moving photography. The extraordinary impression it creates is so unique and complex that I doubt my ability to describe it with all its nuances. However, I shall try to convey its fundamentals. When the lights go out in the room in which Lumière’s invention is shown, there suddenly appears on the screen a large grey picture, “A Street in Paris” — shadows of a bad engraving. As you gaze at it, you see carriages, buildings and people in various poses, all frozen into immobility. All this is in grey, and the sky above is also grey — you anticipate nothing new in this all too familiar scene, for you have seen pictures of Paris streets more than once. But suddenly a strange flicker passes through the screen and the picture stirs to life. Carriages coming from somewhere in the perspective of the picture are moving straight at you, into the darkness in which you sit; somewhere from afar people appear and loom larger as they come closer to you; in the foreground children are playing with a dog, bicyclists tear along, and pedestrians cross the street picking their way among the carriages. All this moves, teems with life and, upon approaching the edge of the screen, vanishes somewhere beyond it. It is terrifying to see, but it is the movement of shadows, only of shadows … Suddenly something clicks, everything vanishes and a train appears on the screen. It speeds straight at you — watch out! 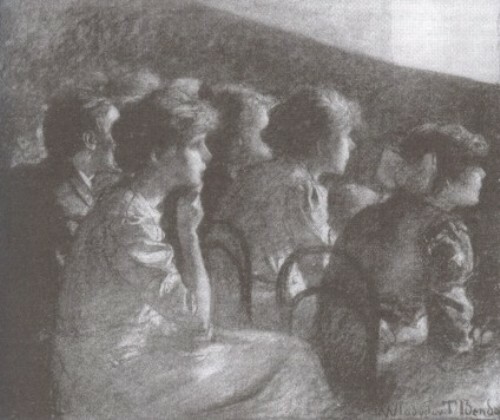 Comment: This famous first impression of witnessing motion pictures was written by the Russian writer Maxim Gorky (1868-1936) after attending a Lumière film show organised by Charles Aumont at the Nizhny-Novgorod All-Russian Exhibition on 30 June or 1 July 1896. Aumont’s Théâtre Concerto Parisienne also served as a brothel. This entry was posted in 1890s, Newspapers, Russia and tagged Brothels, Colour, First impressions, L'arrivée d'un train (1896), L'Arroseur arrosé (1895), Lighting, Maxim Gorky, Nizhny-Novgorod, Partie d'écarté (1896), Repas de bébé (1895), Screens, Silence. Bookmark the permalink.